I think San Francisco is the #1 city for getting dolled up on more occasions than any other place. There are all the Halloween parties. There’s the Bay to Breakers–should you choose to be clothed. There’s the Castro on any given day. And then there are the Burners who are on daily rotation of costumes. But there are even more occasions that randomly pop up. 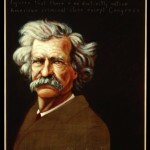 Next week is the Mark Twain Ball celebrating the release of his new autobiography. Did you hear? According to his wishes, 100 years after his death, he wanted this work published. Incredible! I’ve already ordered mustaches on sticks. Top hats would be even better. I’ve been itching to sign up for a race and what better way to start Thanksgiving morning than the annual Turkey Trail Trot where runners dress up like pilgrims and indians. I want to be Princess Pocahontas. Burning Man’s holiday party MAS HTHANKSZAWEENMAS always has a costume contest component–not that everyone doesn’t already don costumes for any Burner party.